Sunday 6 October saw the official launch of a Charity calendar aimed at raising much needed funds for the Children of Emaús. The calendar features 20 lovely ladies adorning gleaming Harley Davidson motorcycles. The calendar is sponsored and supported by Bay Radio, in association with the Costa Blanca Bikers España Group who have both done so much throughout 2013 to raise funds for Emaús. The cost of the calendar is 6 euros, with all monies generated going directly to the charity. The cost of producing the calendars has been met through advertising revenue, and sponsorship by Bay Radio. 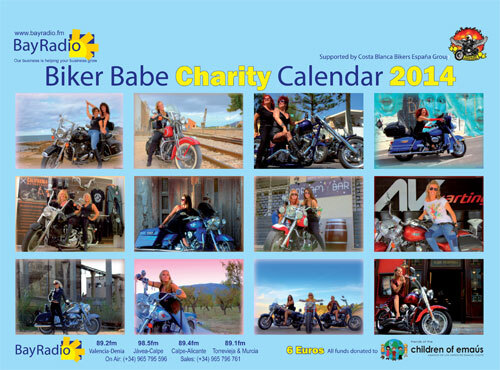 The 20 Biker Babes featured in the calendar are taking on the responsibility of selling up to 300 calendars, but with Bay Radio Javea and High Street Heaven holding a stock of calendars for direct sales to the public. The official photographer for the Biker Babe calendar is Debbie Gibbons from Zeborajane Photography and with a special thanks to Debbie for having produced a superb range of photographs at unique locations. This is Debbie’s first major commission of her talents behind the lens. The monies from the calendar will ensure that the children in the care of Emaús this Christmas will know the kindness of those they have never met. So please buy your copy and enjoy having this colourful calendar on your wall throughout 2014.